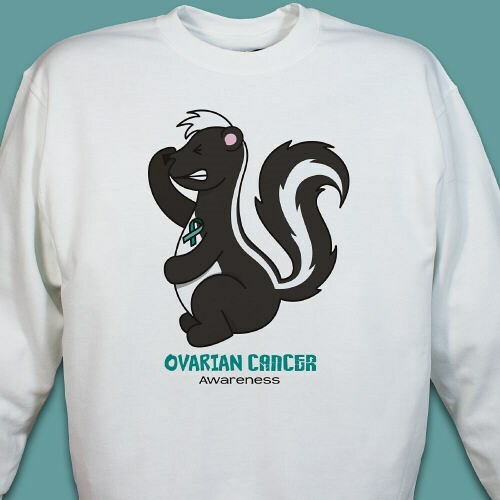 This skunk says it all when it comes to ovarian cancer. Our Ovarian Cancer Awareness Sweatshirt is great for catching the attention of all and helps to spread ovarian cancer awareness so we can get closer to living an ovarian cancer free world. Your Ovarian Cancer Advocate Sweatshirt is available on our premium white, pink & ash grey cotton/poly blend sweatshirt, machine washable in adult sizes S-3XL. Additional Info Gather your support team and start spreading Ovarian Cancer Awareness with eye-catching Ovarian Cancer Awareness Apparel & Walk Gear, from MyWalkGear.com. You will also enjoy this great design featured on our Ovarian Cancer Awareness Water Bottle & our Ovarian Cancer Awareness Hoodie as well.